Emerald Ash Borer, Ash trees, When to treat? What to use? Emerald Ash Borer (EAB) is an invasive non-native beetle from Asia. The native range of EAB is eastern Russia, northern China, Japan and Korea. This Asian beetle was first detected in southeastern Michigan and Windsor, Ontario in 2002. The first New York infestation of emerald ash borer (EAB) was discovered in Cattaraugus County in 2009. The following year, EAB was found along the Hudson River Valley and has since spread to more than 30 counties and spreading at a rapid rate. One can safely assume that all regions of the state could have EAB populations. EAB has now spread to 25 states and killed more than 50 million trees across the US. EAB is a serious pest everywhere ash is found, in both natural forests and urban landscapes. EAB attacks and kills every North American ash species (Fraxinus sp.) including green, white, black and blue ash. It has the potential to completely eliminate ash as a viable species over its entire range. Most long-distance movement of EAB has been directly traced to ash firewood or ash nursery stock. EAB is not a particularly strong flier. Adults typically fly less than ½ mile from their emergence tree. New York currently has a regulation restricting the movement of firewood to protect our forests from invasive pests. 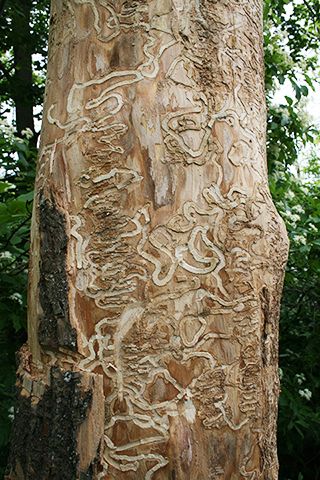 Ash trees are damaged and killed by EAB larvae feeding in galleries under the bark. The larval feeding injures the phloem and xylem tissue that plants use to transport nutrients and water. A few galleries have only a small effect on most trees but as the EAB population grows and more larvae feed on a tree, the galleries interfere with the ability of the tree to transport nutrients and water and the effects on the tree becomes more severe. Canopies begin to thin because fewer leaves can be supported by the tree. Large branches or even the trunk can be girdled and killed by the larval galleries. Infested trees gradually die over a 2-4 year period. When should you begin treating your trees? Ash trees should be treated when EAB is know to be present within a 10 to 15 mile radius from your tree. Early detection of EAB is critical to managing this invasive species. Most infestations are several years old by the time they are detected. This is often too late for treatments to be effective. If the tree has lost more than 50 percent of its canopy due to EAB infestation, treatments are unlikely to save the tree. Once discovered, the spectrum for managing EAB infestations varies from “no action” to “aggressive management.” Aggressive management removes dead and declining ash trees while treating the remaining trees. It is best to begin using insecticides while ash trees are still relatively healthy. By the time most people notice canopy thinning or dieback, EAB has already caused considerably injury to the vascular system of the tree. An effective insecticide may stop additional damage, but it cannot reverse damage that has already occurred and it takes time for trees to recover. Most insecticides used for EAB control act systemically, the insecticide must be transported within the tree. In other words, a tree must be healthy enough to carry a systemic insecticide up the trunk and into the branches and canopy. How to detect the presence of EAB? 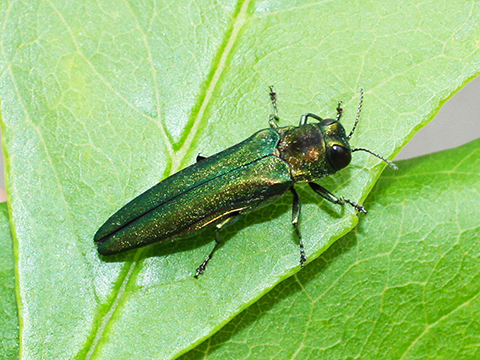 To discover an early EAB detection method, researchers in Ohio investigated and documented symptoms associated with the EAB ash tree complex in urban sites for four years. Researchers discovered that EAB-positive trees tend to have branch fractures within the upper canopy, specifically located closer to the union of the trunk and the stem. Trees infected with EAB break first in the top of the tree canopy, which can be hard to see from the ground. Bark cracks around the first scaffold branch/stem union area are highly correlated with the presence of EAB in the tree. These discoveries allow for EAB to be detected a full year earlier than previously possible, allowing for early treatment that potentially can save the tree. Homeowners can make an early diagnosis by looking for cracks near the lowest branch, and limbs that break closer to the trunk in the upper to middle of the tree canopy. 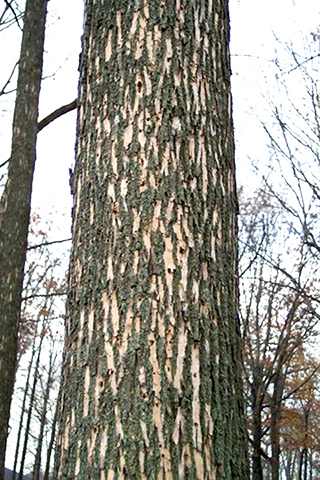 Other signs of EAB damage is woodpecker feeding on the bark, flaking of the outer bark that leaves light tan patches called blonding on the trunk, die back of the tree crown, thinning of the crown and epicormic sprouting or new shoots emerging from the lower trunk of the tree. Most of these signs do not occur until the tree has been infested for some time and is in decline and it is too late for the tree to reover. Optimal timing is required to achieve best control. Two life stages of EAB are targeted by treatments: adult beetles and young larvae. Therefore, systemic insecticide applications should be made in time to allow for uptake and distribution of the insecticide within the tree to ensure adult beetles and very young larvae encounter the toxin. What time of year should I treat? Adult EAB feed on ash foliage throughout their life span and females must feed on leaves for at least 14 days before they begin laying eggs. This provides a window of opportunity to control the adults before any new eggs or larvae are produced. The onset of adult beetle emergence begins from early May to early June and peaks two to three weeks later. First emergence of EAB also closely coincides with the period when black locust trees bloom. This phenological indicator is a reliable predictor of EAB emergence. Emergence of adult EAB consistently begins at 450-550 growing degree days, based on a threshold of 50 ºF and a starting date of January 1. Beetles are most abundant at about 1,000 growing degree days. Peak egg hatch and larval establishment occur between early June and mid-August, depending on location and weather. Young larvae are more susceptible to insecticides than are older larvae. Controlling young larvae prevents damage to the tree caused by older larvae that feed in larger galleries and thus injure more area on the tree. The efficacy of insecticide treatments will likely decline if they are applied later in the growing season. There are multiple treatment options available to help save trees from EAB. Plus, treating a tree is a much less expensive option than replacing it with one of a similar size. Treatment over the course of several years may be a fraction of the cost of removal, and the tree will continue to provide benefits for years to come. In two Ohio studies with street trees ranging in size from 15- to 25-inch DBH, a single application of emamectin benzoate provided excellent control for two years, even at the lowest rate. There was no sign of canopy decline in treated trees and very few emergence holes, while the canopies of adjacent, untreated trees exhibited severe decline and extremely high numbers of emergence holes. In another trial, large trees, ranging from 32 to 47 inches DBH, were treated in alternate years with emamectin benzoate at medium-low or medium-high rates. Canopies of all treated trees remained healthy four years later (after two treatments) despite high pest pressure and numerous declining (untreated) trees in the immediate vicinity. Additional studies have concluded that Emamectin benzoate consistently provides at least two years of EAB control with a single application, even in large and very large trees under intense pest pressure. It also provided a higher level of control than other products in side-by-side studies. I use Brandt enTREE tree injectors to inject Ebamectin benzoate into the trunk of the ash trees. This method is relatively quick and provides two year control of EAB. This table will give you an estimate of the material cost to treat an ash tree with a know diameter or circumference. This table does not include the cost of labor to apply the material. Labor costs will decrease as more trees are treated at the same time. Blonding of ash bark caused by woodpecker feeding. When blonding is visible the tree is too far gone to save.